ASPEN, COLO - The deadline for pre-registration for the 30th annual MotherLode Volleyball Classic is Friday (August 16) as event organizers expect more than 1,400 volleyball players to compete here in North American's premiere doubles tournament August 29-September 2. The registration is $55 ($75 for entries after August 17). Entries with checks payable to Motherlode Volleyball can be sent to the Motherlode Volleyball Classic (17011 Lincoln Avenue PMB 447, Parker, Colo. 80134). Late registrations will be accepted on a space available basis the day of the event. The registration desk will open at 8 a.m. (MDT) each day of the MotherLode Volleyball Classic. Featuring both sand and grass court competition, the 30th annual Motherlode Volleyball Classic will be held here over five "glorious late summer days" (August 29-September 2) at various sites throughout one of the United States' premier resort playgrounds. Rated the No. 1 Pro-Am tournament in North America, the 30th MotherLode Volleyball Classic will attract over 700 teams from all over the nation to compete in what has been called the "toughest amateur tournament in the United States" and "the most exciting 'non-tour' professional event going." Offering 17 divisions of play in men's (8 classes), women's (5) and co-ed (4), the Motherlode Volleyball Classic is the "most comprehensive" beach volleyball tournament in North America with some of the best beach volleyball east of the Pacific Coast Highway. The Motherlode Volleyball Classic's "open" classes for both men and women features the United States' top pro beach volleyball players competing on the main championship sand courts at Koch Lumber Park. In addition to the 1,400 participants, the Motherlode Volleyball Classic attracts thousands of spectators that flock to the Aspen-area every Labor Day Weekend to attend "the best volleyball party in the country." The 2001 "open" champions were Canyon Ceman/Adam Jewell (men) and Daven Casad-Allison/Alicia Scott (women). Ceman is currently teamed with Mike Whitmarsh, the Silver Medallists from the 1996 Atlanta Olympic Games, and Jewell is playing with Ian Clark, a 2000 Motherlode Champion. 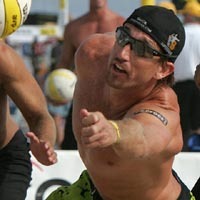 Casad-Allison, who went to high school in Paonia, Colo., and Scott, who lives in Evergreen, Colo., are currently playing on the AVP Pro Beach Tour. Produced by MotherLode Volleyball Productions of Aspen, "The 'Lode" incorporates the best of traditional beach volleyball creating the "old time" sense of joy and excitement for the sport. It is a "must attend" event for the serious volleyball aficionado - providing an exciting, competitive end-of-the-season volleyball event surrounded by the beauty and excitement of Aspen. 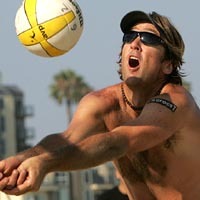 For additional information about this highly successful and hugely popular beach doubles volleyball event at the premier summer/winter resort, please telephone 720/851-7953 or visit the Motherlode Volleyball Classic website at www.motherlodevolleyball.com. For information regarding activities in the Aspen/Snowmass-area during the Labor Day weekend, please telephone the Aspen Chamber Resort Association (800/262-7736) or visit www.aspenchamber.com. · All divisions play double-elimination. Times for finals are estimated and may occur before or after the times listed. · Men's Seniors and Women's Masters competition with the finals at 6 p.m. (MDT) at Koch Lumber Park. · Men's Masters competition at Koch Lumber Park. Co-ed divisions competition with the finals at 6 p.m. at Wagner Park. · Men's Masters finals at 10 a.m. at Koch Lumber Park. Men's Open, AA, A, BB and B, and Women's Open, AA, A, BB and B begin competition at various locations in Aspen. · Men's Open, AA, A, BB and B, and Women's Open, AA, A, BB and B continue competition at various locations in Aspen. Tournament Party - The Club Chelsea, the official party headquarters of the 30 MotherLode Volleyball Classic, hosts a party for all participants Sunday starting at 7 p.m.
· Men's and Women's Open continue competition at Koch Lumber Park. Men's and Women's Open final will not begin before 2:30 p.m.
· When making arrangements, please refer to the "Preferred MotherLode Volleyball Classic Package" in order to receive the special event discounts available to you and your group. United Airlines/United Express - Offering special discounts unavailable to the general public, 800/521-4041, ID# 592-SV. Refer to MotherLode Volleyball Classic. Book early as prices raise weekly. Snow Limousine: (offering the best fares to any location in and around the Aspen/Snowmass area) Service from and to Aspen, Grand Junction, Eagle and Denver airports. Telephone 877/859-5466 for reservations and 970/544-6475 for local service. · Men's Open - 1, Canyon Ceman/Adam Jewell of Hermosa Beach, Calif., 2, Dane Hansen, Lakewood/Ryan Post, Denver, 3, Shawn Garus,Colorado Springs/Chad Turner of Clearwater, Fla.
· Women's Open - 1, Daven Casad-Allison, Santa Barbara, Calif./Alicia Scott, Evergreen, 2, Terri McNair, Greeley/Aimee Sorensen, Denver, 3, Patti Smith/Shannon Williams, Dallas, Tex. · Men's AA - 1, Mike Dauernheim of Naperville, Ill./Steve Ijams, Hermosa Beach, Calif., 2, Joey Burda, San Antonio, Tex./ Bivin Sadler, Dallas, Tex., 3, Skye Gosewisch, Lee Summit, Mo./Kipp Howard, Olathe, Kan.
· Men's A - 1, Richard Arellano/Mike Hodson of Dallas, Tex., 2, Steve Chapman/Trent Nauholz, Des Moines, Iowa, 3, Chris Gregg, Los Angeles, Calif./Will Gutierrez, San Diego, Calif.
· Men's BB - 1, Tony Plepys/Dave DeSaulniers, Austin, Tex., 2, Mark Evans/Lucas Galmarini, Kansas City, Mo., 3, Rory Booth/Jerrod McCullum, Amarillo, Tex. · Men's B - 1, Michael Guiietz/Mike Sloger, Chicago, Ill., 2, Brian Combs, Overland Park, Kan./Eric Hogan, Wichita, Kan., 3, John Corpuz/Russell Craig, Dallas, Tex. · Women's A - 1, Leslie Delaney, Temecula, Calif./Gina Hazard, San Diego, Calif., 2, Nicki Fusco/Suzane McReynolds, Denver, 3, Marnie Adams/Leanne Haarbauer, Seattle, Wash.
· Women's B - 1, Deb Crockett/Shirley Vai, Colorado Springs, Colo., 2, Connie Hogan/Ester Hurtado, Albuquerque, N. M., 3, Melissa Dickelman, Melissa Renald, Colorado Springs, Colo.
· Women's BB - 1, Novelett Jensen, Blaine, Minn./Alana Kiehn, Chaska, Minn., 2, Michelle Krysiak/Laura Smiricky, Chicago, Ill., 3, Amy Blakney/Erin Crawford, Dallas Tex. · Men's Senior (50-plus) - 1, Jon Lee, Santa Barbara, Calif./Don Shaw, Menlo Park, Calif., 2, Dan McCarty, Aspen/Terry Bannick, Englewood, 3, Mark Andrews, Council Bluffs, Iowa/Dave Strawn, Denver. · Men's Senior (45-plus) - 1, Jon Hastings, San Luis Obispo, Calif./Andy Shroeder, Concord, Calif., 2, Brant Lee, Santa Barbara, Calif./Dan Salyer, San Luis Obispo, Calif., 3, Bob Blackburn, Salida/Dave Lawless, Aurora. · Men's Masters (37-plus) - 1, Eric Anderson, Los Gatos, Calif./Kent Kitchel, Santa Cruz, Calif., 2, Paul Cook/Reed Stephenson, Steamboat Springs, 3, Dave Mear of Gunnison/Larry Mear, San Clemente, Calif.
· Women's Masters (35-plus) - 1, Jeanne Goldsmith/Linda Hanley, Pacific Palisades, Calif., 2, Patti Smith/Shannon Williams, Dallas, Tex., 3, Alice Hansen, Raleigh, N.C./Becky Snider, Lakewood. · Coed Open - 1, Alice Hansen, Raleigh, N. C./Scott Smith of Denver, 2, Joey Burda/Mel Karkowski, San Antonio, Tex., 3, Patti Smith/Kelly Stern, Dallas, Tex. · Coed A - 1, James Pinto/Tammy Wechwerth, Longmont, 2, Nicki Fusco/Joel King, Denver, 3, Kim Fricke/Jeff Watson, Dallas, Tex. · Coed BB - 1, Danny Morgan, Kansas City, Mo./Trish Wade, Wichita, Kan., 2, Denny Jackson/Maria Stork of Kansas City, Mo., 3, Mike Carroll, Richardson, Tex./Pam Corr, Mesquite, Tex. · Coed B - 1, Brenda Osterbuhr/Hal Taylor, Denver 2, Lisa Booth/Marc Scott, Phoenix, Ariz., 3, Jeremy Glass/Virginia Krauss, Blaine, Minn.